Each city is different. Each city must therefore meet specific needs and challenges. Each city therefore develops its own smart city vision. 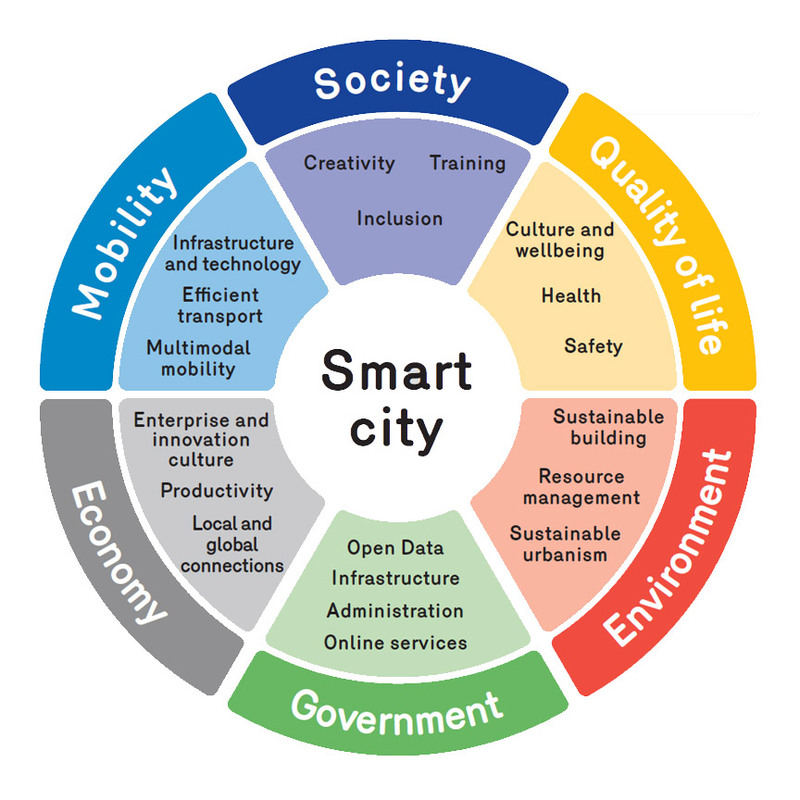 Consequently, how can the smart city be defined? Zero carbon city, connected city, efficient city, resilient city, laboratory city… there are as many definitions as there are smart cities. Smart cities are also found on every continent. A few points in common however exist between these different visions of the smart city. The smart city can thus be understood with the help of 6 key words. Its concrete results and objectives can also be grouped into 6 action areas. Finally, the technologies of the digital age are often regarded as the guiding thread of the transformations at work in the smart city. Collaborate: in the smart city, public services operate in an open environment. They exchange their data and share their projects to make services more efficient and more effective, focused on the users, while creating economies of scale. Save: the smart city thinks in a sustainable way and therefore saves energy, water, raw materials, food and financial resources to continue to prosper in an era of transition while reducing its polluting emissions. Innovate: the smart city must encourage its citizens, its businesses and public services to come up with new ways of organisation, sharing, communicating, producing… to develop urban dynamism through innovative services. Integrate: the smart city cannot leave anyone behind and must therefore enrich each person’s quality of life, by reducing the social divisions of education, gender, health, safety, etc. Participate: the smart city is not a real city if it does not associate its citizens, its businesses … with its projects. Nobody can be left on the side lines in the smart city! Participation is key to good governance in the smart city. Simplify: smart cities, except for a few rare smart cities created from scratch, all have a past during which regulations or customs have gradually developed… sometimes obsolete, sometimes counterproductive and often out of phase with the simplicity of web-based services. The smart economy: it is a city that wants to position itself as a capital of the new economy and innovation as well as a centre that draws people to it. Smart governance: it is a city whose public services have entered the digital era with efficient online services, wifi and the use of digital data produced in the city. The smart environment: it is a city which reconciles its roles as a living space, for mobility, an economic centre… while reducing its footprint on the planet (reduced consumption of energy and natural resources and reduced polluting emissions). Smart mobility: it is the city which organises itself to offer an alternative to car congestion and pollution by promoting the effectiveness of means of collective and sustainable travel. The smart population: it is a city which fosters the development of its citizens by levelling out inequalities and encouraging them to acquire skills. The smart living environment: it is a city which pushes itself up to the highest level in terms of health and safety for example. Smart cities all share the characteristic of acting on their services and activities to make them more efficient. The ways they achieve this are very diverse, but they often have in common to use of digital technology resources (or ICTs, information and communication technologies). The degree of integration of ICTs in the urban functions is sometimes even considered as the criterion that marks out smart cities from other cities. The lowest layer, digital data, in particular, are the smart city’s raw material, which are continually growing. It is “Big Data” which transforms the data into new services. Whereas Open Data is where these services are supplied with data from the public authorities. The middle infrastructure layer brings together all the necessary equipment to make these data available, thanks to sensors (pollution probes or video cameras for example), telecommunications networks (optical fibre, wifi) and data centres (where the data are stored). The software is the top, smart layer, the one which creates information from the data, such as a mobile application cross-referencing public transport timetables, locating a bus in traffic or that of a smartphone used to inform the user when their bus will arrive.